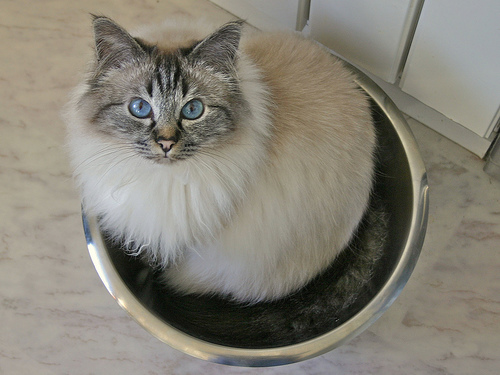 Pets Costs > Cat Breeds > How Much Does a Birman Cat Cost? The Birman cat became popular because it is considered the sacred cat of Burma. The Birman cat is known for its pale colored body, deep blue eyes and many dark spots, which gives the cat a mysterious look. The costs of a Birman cat depends on the geographical location, the breeder selling the kitten, the age and quality. According to our research, the average Birman kitten can cost anywhere between $400 and $650. Show quality cats, however, can be much more, often costing as much as $1,500 or more. BirmanBreed.net says it’s not uncommon to see a high-quality show breed cost $2,000. Average Breed More than likely will come from a purebred parent but will have some defaults according to the standard. Even if you wanted to show off this cat, it probably won't have a good chance of winning and will be considered a household cat. $600 to $1,000, with males selling for about 30% less than females. Reputable breeders will often include registration paperwork, up-to-date vaccinations, a health guarantee and a travel crate if it’s going to be shipped. Some breeders may also include a microchip and TICA registration if available. Before you’re able to bring the kitten home, a breeder will ask for a non-refundable deposit, often around $200 to $400, if the kitten isn’t available that days. Once you pick up the cat, the deposit will then be applied to the total cost. Reputable breeders will wait until the kitten is eight to 12 weeks before you’re able to take it home. As with any animal, be sure to factor in the recurring costs such as food, accessories, cat litter and routine/surprise vet visits. The average cat owner can spend up to $600 per year if the cat is healthy and much more if it were to come down with a disease or surgery. While a professional grooming session isn’t required, it will need regular grooming sessions to keep a healthy looking coat. Not only will these grooming sessions help with the cat’s coat, it will also help circulate the skin, removing any debris and loose hair that’s present. Since it can be hard to find one of these cats locally, you may have to pay an additional fee to have the cat shipped or transported via a car. An airline can charge $200 to $400, while ground transportation could cost up to $350, depending on the distance being traveled. The coat is known to be long, soft, silky and common colors may include blue, chocolate, lilac, seal and spotted. The coat is a single coat, and they won’t have an undercoat like other breeds, making it non-matting. With proper nutrition, the shedding should be kept at a minimum. Males often weigh more than females, weighing close to nine to 15 pounds, while females weigh less than 10 pounds on average. Its temperament is known to be extremely sociable, gentle, affectionate and active. It can do well with children as long as they are trained to handle with care. Not fearful of strangers, the Birman is known to be affectionate with anyone who walks through the door. When compared to other breeds, CatBreedsList.com says it tends to be very quiet and isn’t known to vocalize as much. Try to inspect the cattery in person to see how the cat socializes and the cleanliness of the area. A clean area often shows the owner cares about their cats and can reflect their organizational habits. When signing a contract, always make sure it comes with some sort of health warranty and know what may happen if the cat were to die within a few months of owning it. It’s best to take it to a vet’s office 24 hours after adoption to see if any problems persist. When choosing a breeder, try to get as many references as possible. It also doesn’t hurt to check out their reputation online as well. If you’re able to find one, a retired show cat can be much less. It also doesn’t hurt to check out a local rescue group or Humane Society to see if any older cats or kittens which may look similar are up to for adoption.